The Merganser duck is a beautiful member of the bird species and is known for their large bodies and majestic markings. Merganser ducks are most commonly found on large rivers, lakes and reservoirs. Male and female merganser ducks are easily distinguishable, as the males have clean white bodies with dark green heads, and a slender and serrated red bill. The females are very elegant looking with gray bodies and rich cinnamon heads and a short crest. The Merganser bird nests in the cavities of large trees and during breeding season, they will be found in mature forests close to large lakes and rivers. 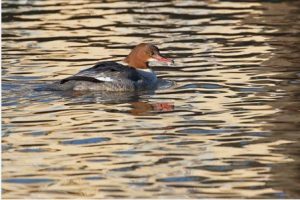 During the winter months, Mergansers spend their time in the southern and coastal regions on large lakes, rivers, and reservoirs as well as in the northern and western U.S. The Merganser prefers freshwater over saltwater. This bird species typically eats on fish, insects, mollusks, crustaceans, worms, frogs, small mammals, and plants. For foraging, they prefer clear aquatic waters of streams, rivers, lakes, coastal bays, and estuaries. Their prey is found by sight and they feed heavily on fish the most during the winter months. During nesting season, Merganser birds can produce anywhere from 6 to 17 eggs at a time. The nesting location, in the cavity of large trees, is usually found up to 100 feet off the ground and a distance of one mile from a water source. The Merganser is a more docile of bird species in the sense that they spend a lot of their time afloat, loafing and sleeping on open water as well as fishing for food. When forming flocks for migration, there can be up to 75 birds in a flock. A Merganser bird is a popular choice for hunters all across the country. 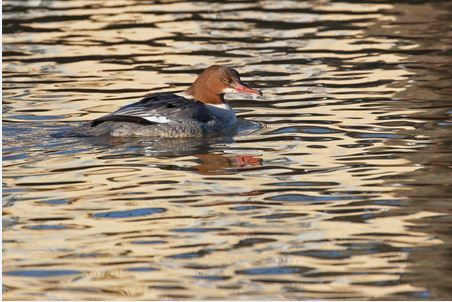 With its spectacular appearance and great meat, we are always on the lookout for a Merganser. Pluck A Duck welcomes you to join us on an upcoming duck hunt. For more information, contact us today.